The weak equity returns experienced by the markets since the beginning of the year have resulted in a low level of bullish investor sentiment. The Dow Jones Industrial Average Index and the S&P 500 Index are down on a year to date basis 7% and 8%, respectively. The Nasdaq Composite Index has fared even worse and is down 12.9% this year. 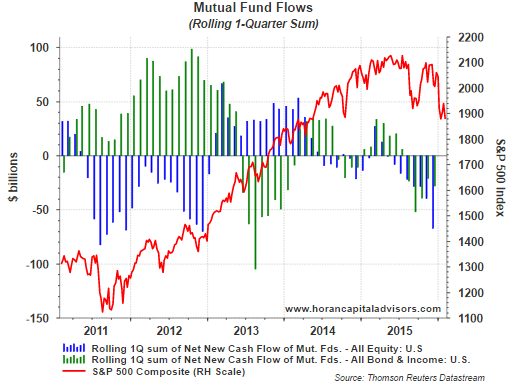 The lack of positive equity momentum and weak bullish sentiment have led to investors reducing exposure to both stocks and bonds as evidenced by recent mutual fund flow data. The above chart incorporates data through the end of last year. 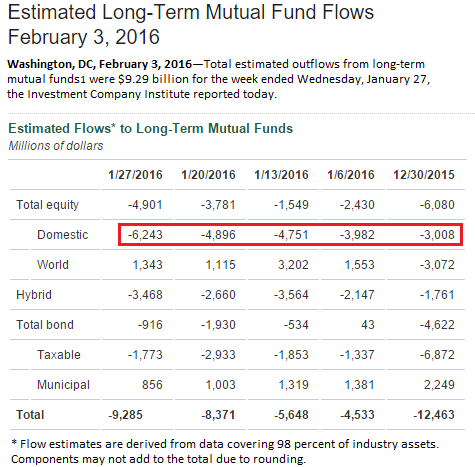 Below is a table from ICI showing weekly outflows have continued into 2016. In mid-January bullish investor sentiment, as reported by the American Association of Individual Investors, came in at 17.90%. 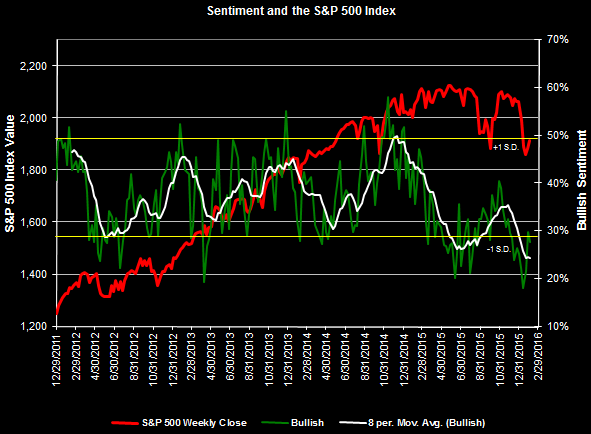 The last time bullish sentiment was reported at this low of a level was in April 2005. Subsequent to the mid-January sentiment report, individual investor sentiment began to improve until falling two percentage points to 27.55% last week. As we noted earlier this month, we do not believe the U.S. economy is headed for a recession. Given all the pessimistic talk of late though, one would think we are in a recession now. Because sentiment is a contrarian indicator, and given the negative fund flow data, maybe the end of this pullback is nearer the end than investors are anticipating.